The end of summer is always hard. 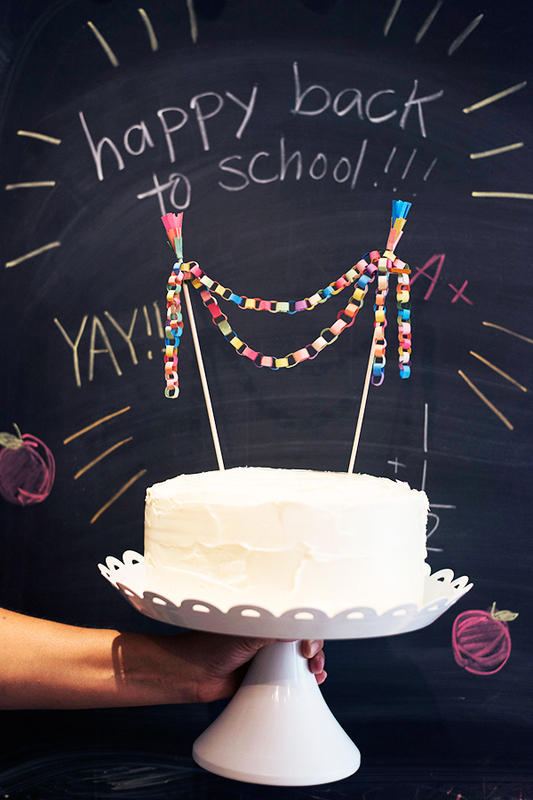 Turn the beginning of the school year into a little celebration with this old-school miniature construction paper chain cake topper. A mini cake would be perfect for this occasion. 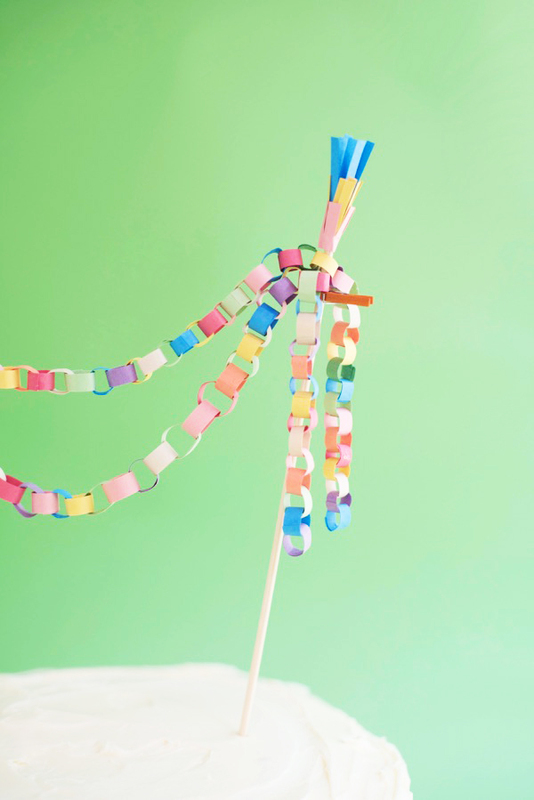 If you have a dollhouse at home, remove the paper chain afterwards and use it to decorate a dollhouse party! 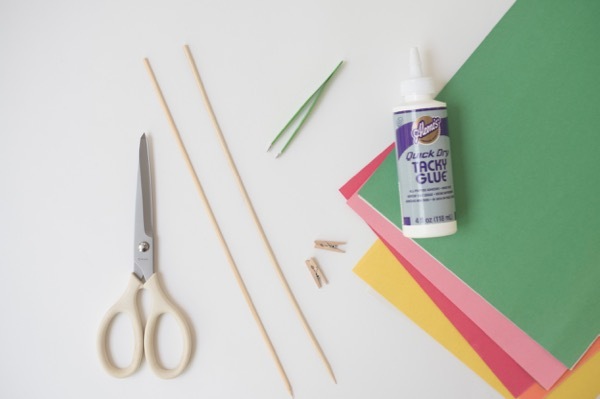 Materials needed: construction paper, scissors, craft glue, tweezers, 2 bamboo skewers, 2 mini clothespins. 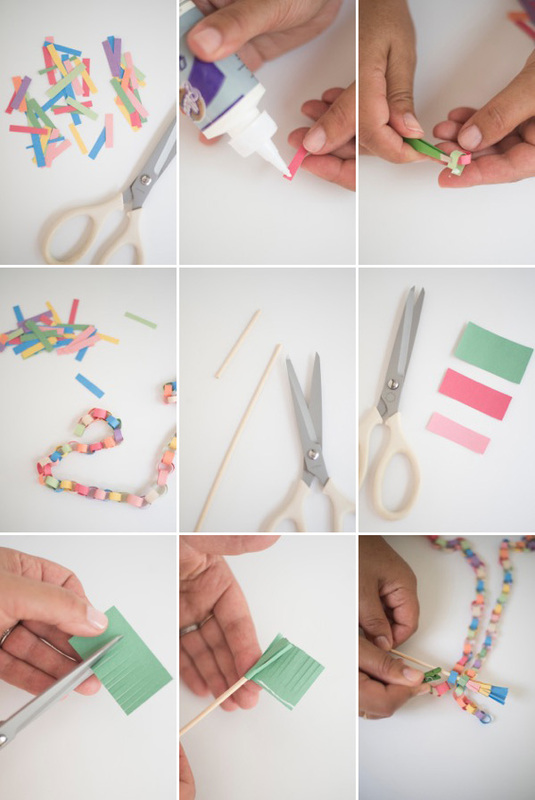 Step 1: Out of a variety of colors, cut strips of construction paper out in 1″ x 1/4″ rectangles. Step 2: Apply a tiny dab of glue to the end of a paper strip, make a loop and hold for 6 seconds till secure. Step 3: Put a different color rectangle through the first paper loop, apply a tiny dab of glue to the end, and using the tweezers, make a loop and hold it for 6 seconds til secure. Step 4: Continue creating the paper chain in this manner until you have about 16 inches. Repeat to make a second shorter chain about 13 inches. Step 5: Cut two bamboo skewers down to about 9 inches in height. Step 6: Cut three small rectangles out of different colors – 1″ x 3″, 1″ x 3/4″, 1″ x 1/4″. Step 7: Cut fringe into each rectangle. Step 8: Apply a line of glue to the bottom of the largest rectangle, and wrap around the top of the skewer, with the fringe facing up. Repeat in descending size with the remaining fringed rectangles. 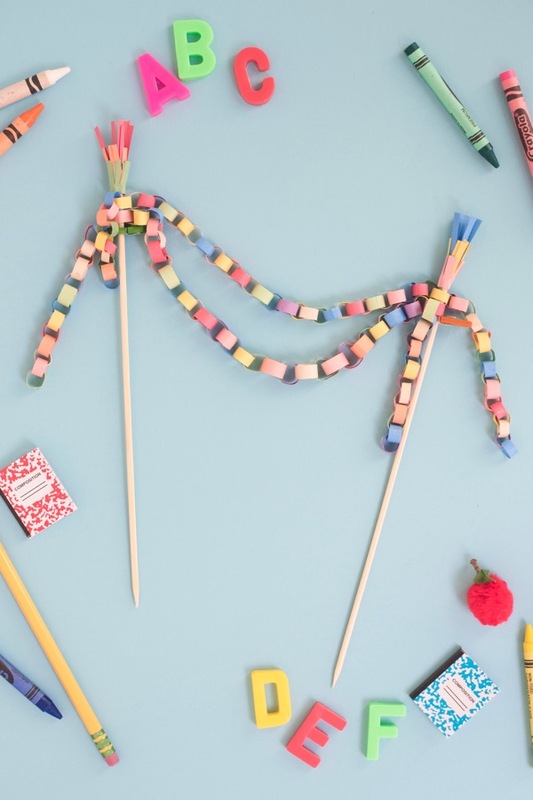 Repeat steps 6 – 8 for the other skewer. Step 9: Lay out the paper chains so they are centered, with the smaller length on top of the larger set. Leave a drop in the chains, and position the skewers about 8 inches apart. Slide the chains up from the pointed end of the skewer, til the reach the tassel. 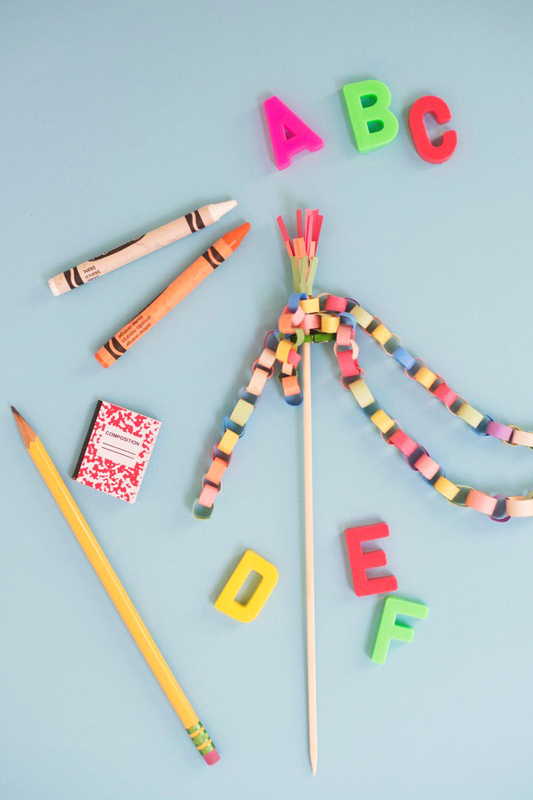 Clip the mini clothespin in place to hold up the paper chain under the tassel. So cute! Now I just need a reason to bake a cake, or do I? 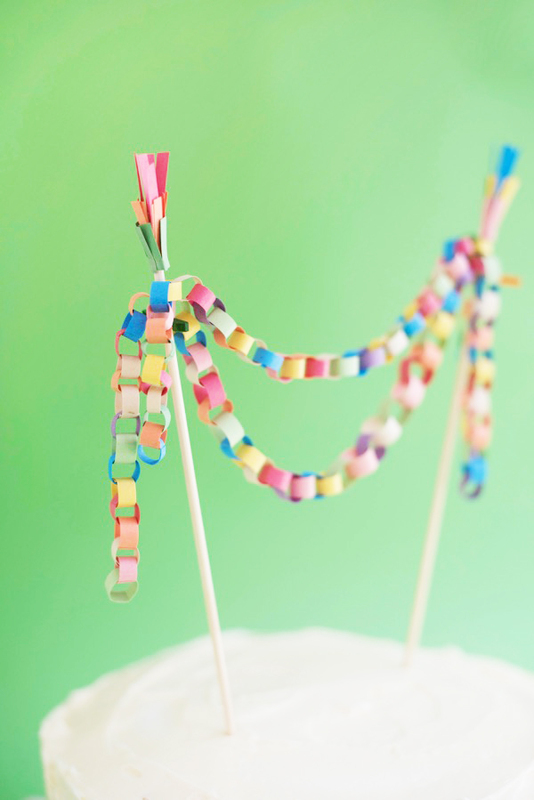 I love anything mini and this is great for a mini or grand celebration! 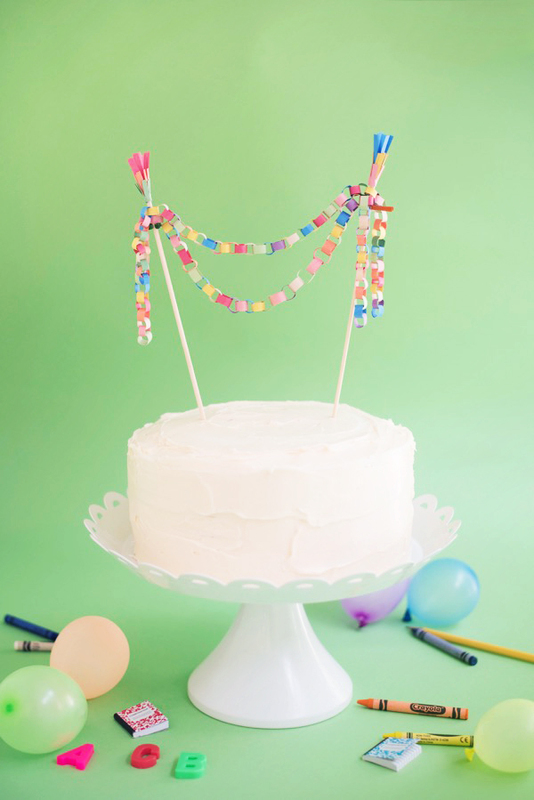 I love this …such a clever cake topper! So cute! I love it! And where did you get the cake stand? Hi Emi – It’s from Target a few years ago, but I think they still carry it! Thanks!